As I was planning my father's memorial service for today I called his good friend and fellow comedian Freddie Roman, to arrange for a room at New York's traditional show business mecca – The Friar's Club. I told Freddie I needed a DVD player so the guests could watch some of my father's old performances. "We'll get a BIG screen," Freddie said, "so he doesn't look too short." "I'm 5-foot-five," my father used to tell the audience. "That's after teasing my hair." But, according to my father, Bobby Shields, short people had many advantages over tall people. Women should prefer short guys like him, he said. "Big, tall guys sweat a lot. With me, a little talcum powder, I'm good for the week." I cleaned that line up a touch. But not much. My father was a very clean comic. I can't remember him ever uttering a dirty word, on stage or off. I spent some time thinking about what image most defined my father. And then it came to me: a sweat-drenched tuxedo shirt. I watched his show hundreds of times when I was growing up. And every time I went back stage, after the show, the tuxedo shirt he worked in was soaking wet. It didn't matter if he was performing for 2,500 people or 25. He worked just as hard no matter what size the audience. He soaked every one of his shirts. That effort, that energy, that sweat, helped explain what made it possible for Bobby Shields to go from a poor shoeshine boy in East Harlem to a successful stand-up comic. He wasn't a big name. But he got big laughs. And he made a good enough living to enable my warm, vibrant, devoted mother to be a stay-at-home mom for me, their only child. She handled that assignment with incredible devotion, and constant watchfulness. I remember coming home from high school a couple hours late one day and there she was on the phone finishing a conversation with these words: "It's OK officer – he just arrived." 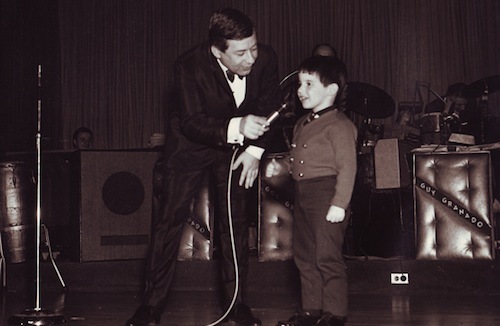 I remember sitting pretty close to ringside with my mother when I was around 10-years-old in the ultimate New York nightclub, The Copa, when the deep, gravelly voice of the Copa capo Jules Podell announced, from somewhere off stage: "Ladies and gentlemen, the comedy star of our show, Bobby Shields."